Last week I had a delightful research afternoon with my former student Lisa Park Boush, now a professor in the Department of Geology and Environmental Science at The University of Akron, and currently Program Director, National Science Foundation, Sedimentary Geology and Paleontology Program, EAR Division. 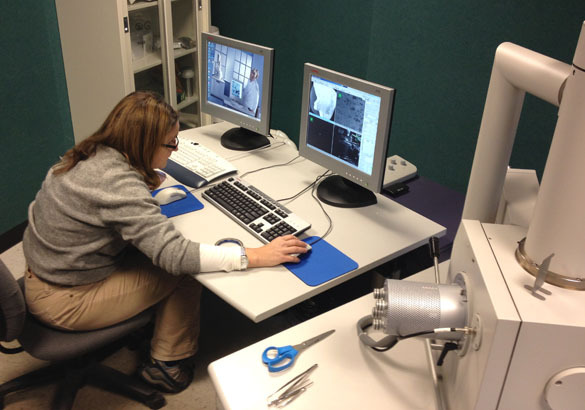 Lisa also directs an Environmental Scanning Electron Microscope (ESEM) lab in Akron. We worked there with the FEI Quanta 200 microscope looking at encrusters on echinoid fragments from the Matmor Formation (Middle Jurassic) of southern Israel. These encrusters are called episkeletozoans, a five-nickel word meaning that they are animals that encrusted the exteriors of skeletal fragments. 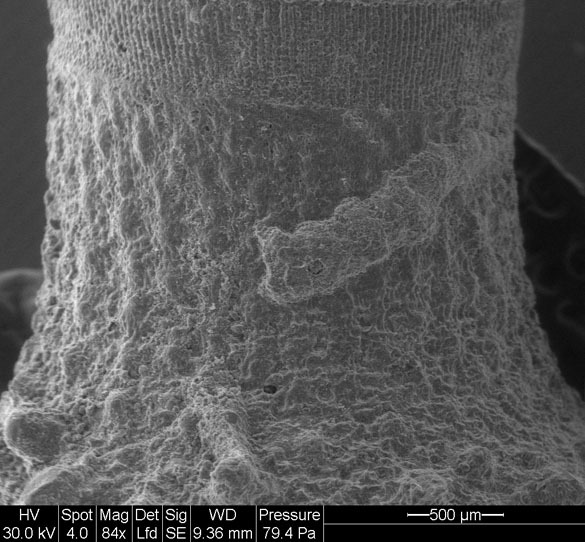 The specimen above is an eroded bryozoan episkeletozoan on the interior of an echinoid coronal fragment. It’s been beat up a bit and partially recrystallized, but we can see enough to identify it as the cyclostome Stomatopora Bronn, 1825. 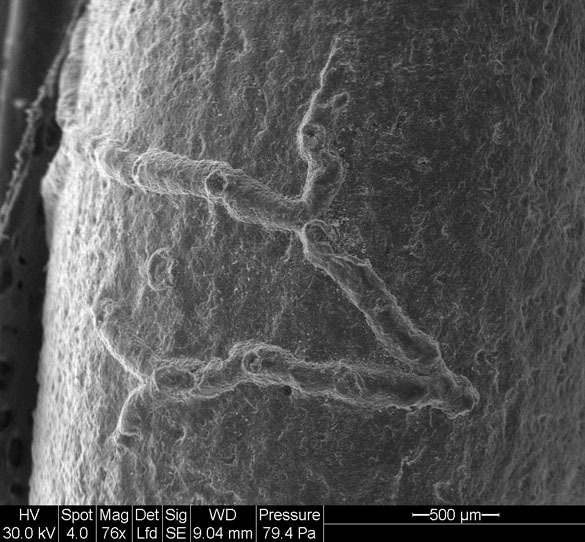 This is the base of an echinoid spine with a tiny foraminiferan attached to it. Here is a close-up of the above foraminiferan. It is probably Placopsilina d’Orbigny, 1850. You can see an apparent aperture looking a bit like a blowhole on the left end top. Above is our hero Lisa running the ESEM. This complicated device uses low vacuum so that we can look at uncoated specimens. We just stuck the specimens onto stubs with conducting tape and placed them in the chamber (on the right). 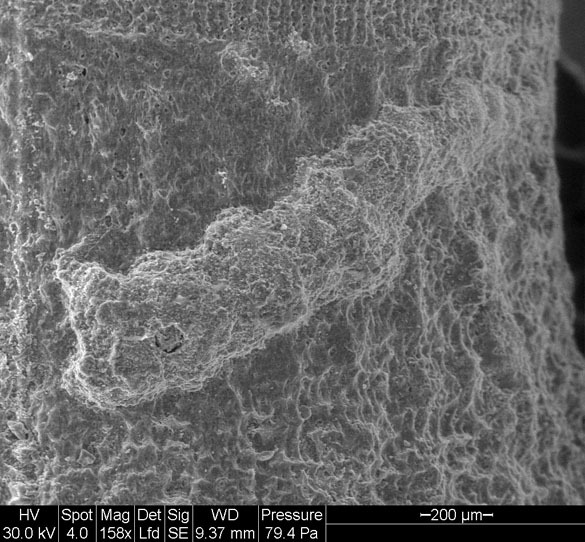 I remember the old days when electron microscopy specimens had to be carefully dried and sputter-coated with gold or carbon. The advent of the ESEM made high quality imaging much easier, and thus more commonly done. The images we took on this day are part of a larger project describing and interpreting the paleoecology of the Matmor Formation. It is a huge task, but every helpful session like this moves us closer to completion. Thanks, Lisa! Richardson-White, S. and S.E. Walker, S.E. 2011. Diversity, taphonomy and behavior of encrusting Foraminifera on experimental shells deployed along a shelf-to-slope bathymetric gradient, Lee Stocking Island, Bahamas. Palaeogeography, Palaeoclimatology, Palaeoecology 312: 305–324. Taylor, P.D. and Furness, R.W. 1978. Astogenetic and environmental variation of zooid size within colonies of Jurassic Stomatopora (Bryozoa, Cyclostomata). Journal of Paleontology 52: 1093-1102. Taylor, P.D. and Wilson, M.A. 2003. Palaeoecology and evolution of marine hard substrate communities. Earth-Science Reviews 62: 1-103. Walker, S.E., Parsons-Hubbard, K., Richardson-White, S., Brett, C. and Powell, E. 2011. Alpha and beta diversity of encrusting foraminifera that recruit to long-term experiments along a carbonate platform-to-slope gradient: Paleoecological and paleoenvironmental implications. Palaeogeography, Palaeoclimatology, Palaeoecology 312: 325–349.